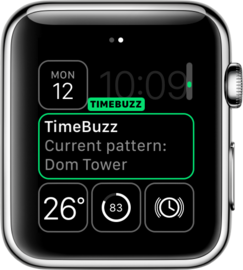 TimeBuzz is an Apple Watch app to feel the current time through vibrations of the Taptic Engine. This app is developed in collaboration with the Bartiméus Sonneheerdt Association, Bartiméus Foundation and Royal Visio in The Netherlands. 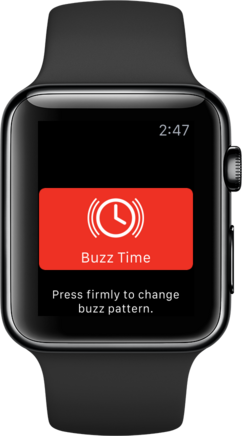 If you open the app on the Apple Watch you will see a large button with the text &apos;Tap to buzz the time&apos;. When you tap this button the app will start buzzing the current time. It will translate the time into a pattern of long and short vibrations whereby it will first buzz the hours and then the minutes. In between every sequence of vibrations there will be a short pause to separate the hours and minutes from each other. 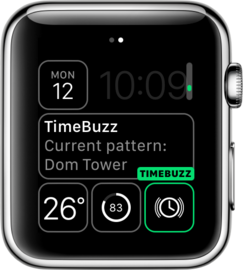 You will feel a distinctive vibrating buzz when opening the app and when you start the buzzing of the current time so that you know when you opened the TimeBuzz app or tapped the button on the screen. With this pattern a short vibration (that feels like a short tick) indicates a 1 and a double vibration indicates a 0. The hours are always in the range from 0 to 12, even in the morning or afternoon/evening. So three o&apos;clock in the afternoon is indicated by 3 short vibrations and not 15. With this pattern the tens of the hours and minuts are indicated with long vibrations and the single digits with short vibrations. For example 13 is indicated by 1 long vibration and 3 short vibrations. With this pattern the tens and single digits of the hours and minutes are not buzzed separately but as one number. As with the Dom Tower pattern, a value of 5 is shortened to a longer vibration. With this pattern the hours are indicated with extra long, long and single vibrations. The minutes are separated into tens and single digits whereby five short vibrations are shorted to a longer vibration. With this pattern both the hours and minutes are separated in tens and the remainder are buzzed separately. A value of five or a multiple of that are shortened to one longer buzz. For example 16 is buzzed as 1 short vibration, a pause, followed by 1 longer vibration and 1 short vibration. In the audio podcast below, David Woodbridge (Assistive Technology Consultant at Vision Australia) explains in detail the options and operation of the TimeBuzz app. Frequently we get the same questions and suggestions from the enthousiastic users of the TimeBuzz app. Below we answer the most frequent questions and suggestions. Can the sound be switched off during buzzing? I want the app to make no sound. Unfortunately this is not possible. There is only one way that Apple offers us to generate the buzz patterns with the Taptic Engine and that automatically comes with these sounds. The only way to prevent this is to put the Apple Watch in silence mode (see Tips). Can the buzz pattern be faster? We would like to do this and also make custom vibrations, but unfortunately we are limited to the standard vibrations that Apple offers us. The speed of the buzz patterns can not be accelerated any further because otherwise there is a risk that buzzes will be skipped and therefore the wrong time will be passed. Can a buzz be generated every half hour or hour? An app can only use the Taptic Engine if it is active and visible on the screen. We can therefore not generate a buzz every half hour or hour in the background. The only option is to use the Workout functionality of the Apple Watch but because TimeBuzz is not a sport activity, we think that Apple will not approve this. It would also drain the battery of the Apple Watch more quickly. Can the buzz that I feel after opening the app be turned off? Yes. 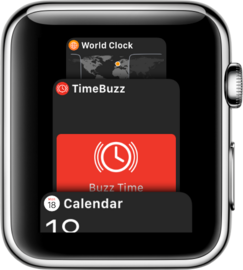 Open the Apple Watch app on the iPhone and go to the settings of the TimeBuzz app. Here you can use the setting &apos;Enable buzz at start up&apos; to switch off or on the buzz that you feel after opening the app. Can the app also work on the iPhone? The possibilities to use the Taptic Engine to the iPhone are even more limited than on the Apple Watch. They are more focused on games and are too limited for TimeBuzz to pass the time. Will TimeBuzz also be available in my language? TimeBuzz is currently only available in English and Dutch. Of course we would also like to support other languages. If you are interested in working on this, please contact me. I have an idea for an app, do you want to cooperate? You can hire me as a freelance iOS and Android developer for designing and developing apps. Sometimes I also work free on ideas and apps for non-profit organizations or open source projects. Use the contact form at the bottom of the page to contact me. By optimizing some settings on your Apple Watch or iPhone you can increase the ease of use of the app. These are all optional and mostly dependent on your personal preference. If you use TimeBuzz often it&apos;s handy to add the app to your favorites. 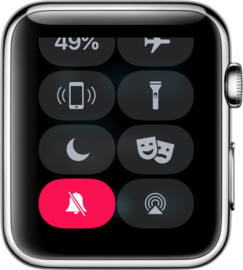 The is a new feaure in watchOS 4 and is activated by pressing the button below the digital crown (the old Friends button). The favorites can be set in the Apple Watch app on the iPhone. 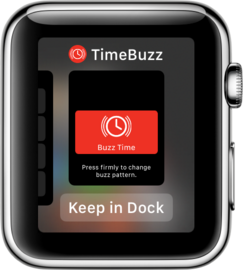 With watchOS 3 you can add TimeBuzz to the Dock by pressing the button below the digital crown (the old Friends button). All apps in the Dock will remain in memory so that TimeBuzz will open almost instantly (except for the first time). Every buzz also generates a sound. 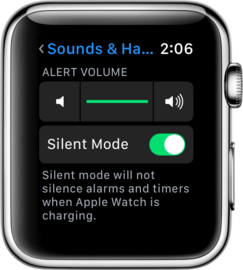 If you want to use the app discretely you can disable the sound on the Apple Watch. To do this, go to the &apos;Settings&apos; app on the Apple Watch and then select &apos;Sounds & Haptics&apos; and enable &apos;Mute&apos;. Or from any watch face, slide up and press the bell icon to enable mute. 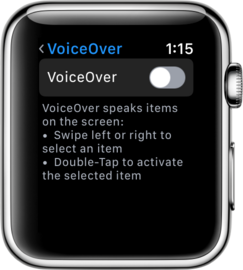 Also turn off VoiceOver when using the app because this will stay enabled even when sounds have been turned off on your Apple Watch. You can select a TimeBuzz complication on your watch face so you can start the app directly from the watch face. Select a watch face that can make use of complications (for example the &apos;Modular&apos; watch face). Press a bit harder (Force Touch) on the screen and choose &apos;Modify&apos;. 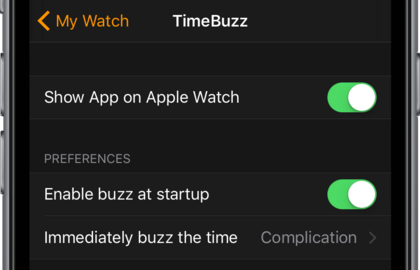 Choose at one (or more) complications the &apos;TimeBuzz&apos; app. By default the screen of the Apple Watch becomes inactive after 15 seconds. This can be increased to 70 seconds, this give the app always enough time to complete the buzzing of the time. 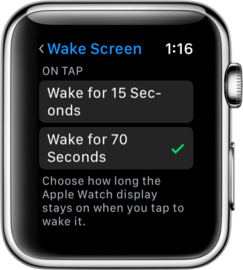 Go the &apos;Settings&apos; app on the Apple Watch, select &apos;General&apos; and &apos;Wake Screen&apos;. At the bottom of the screen &apos;On Tap&apos; select &apos;Wake for 70 Seconds&apos;. When you open the app via a complication on the watch face it will by default immediately buzz the current time or else buzz distinctly to indicate that you opened the app. The immediate buzzing of the current time can optionally be turned off or even set to &apos;Always&apos; to always immediately buzz the current time no matter how the app was opened. It&apos;s also possible to turn the buzzing at start up off all together. The app can be downloaded for $0.99 from the App Store and contains both the iPhone app and the Apple Watch app. Install the app on your watch through the Watch Companion app from Apple. Did you already downloaded the app and like it? Then please let others know how you like the app by writing a review. Do you have any questions, comments or do you just want to get in touch with us, please complete the following form to send us a message. © Copyright 2019 Virtual Pages. All Rights Reserved.